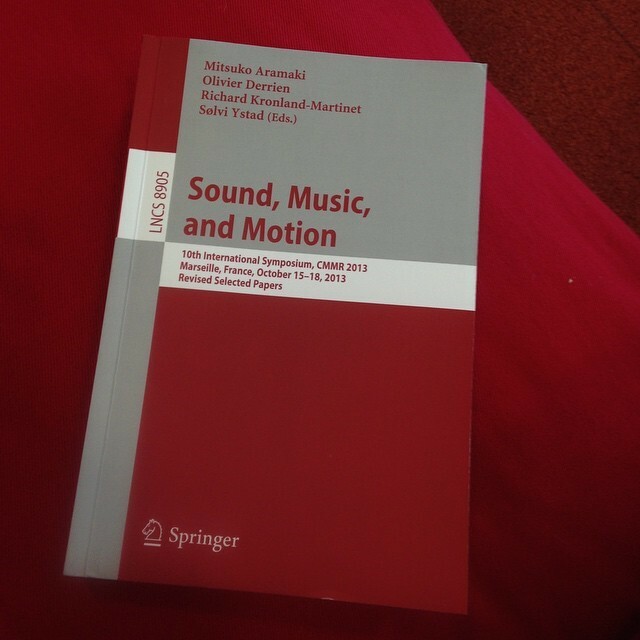 The chapter is entitled “Making Data Sing”, and reports on two projects we were involved with. One of these is Peter Sinclair’s Road Music, a project which uses a single board computer mounted inside a car to generate music directly from sensor data gathered about acceleration, road surface variation, curvature of roads and movement from light to dark or open to built up areas. Atau and I composed a piece for this, turning the data into an Atau and Adam composition, which has been performed across France by a fleet of Renaults. We also discussed an installation I worked on with sound artist Kaffe Matthews entitled You Might Come out of the Water Everytime Singing. This is a 3d sound installation which sonifiies the movements of sharks in the Galapagos islands, creating an immersive, sensual experience for the listeners. This piece has been shown at the Fondation Gulbenkian in Lisbon, the Bluecoat Gallery in Liverpool and the Fruitmarket Gallery in Liverpool, as well as deep within a cave the Netherlands. We describe these pieces in terms of translation of data into different modalities, and extending the affective capacity of the listener, allowing the data to be experienced viscerally and in an embodied manner, as opposed to intellectually or symbolically. We then discuss how this intersects with theoretical discourses drawn from cognitive science and philosophy.